You get access to your own teacher code AND bulk uploading. Note: The code in the picture is not your teacher code. That’s my co-worker’s. He’s not shy about sharing. They sign-up on their own page and enter your teacher code. Students are automatically added to your classroom. It’s like waiving a magic wand. Kind of. 2. You get instant results – even with the code! Discover your teacher code and upload all your students right here. And if you don’t want your students to do anything, you can upload them using our bulk upload tool. Manual data entry is no one’s friend. That’s why we’ve made it significantly easier for you to upload all of your students in just a few clicks using our bulk upload tool. Want to take advantage of bulk upload? Login to your account or sign up for QuizBean. Enjoy the new features and let us know if you have feedback or suggestions to make QuizBean way cooler. Thanks! When our team launched QuizBean to the K-12 crowd a few weeks ago, we received a flood of new sign-ups, tons of feedback from teachers across the country, and super-creative ideas about how to improve QuizBean. We listened to you and started making changes. This is big. You can now send your quiz to any student in your class – no email address required. We simply create a username for them that’s @quizbean.com — but it’s not an email address. 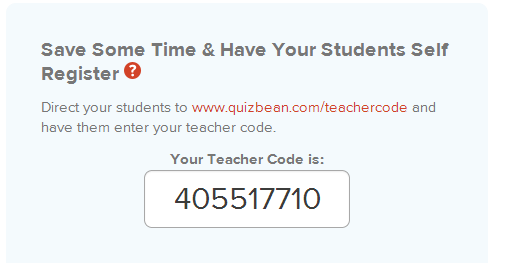 When students log-in with their @quizbean username, they’ll be presented with the quiz in their dashboard. It’s pretty awesome. You asked for accents and characters to be accepted in text fields. And since QuizBean has users from over 130 countries, we thought that should get fixed asap. We’re happy to announce QuizBean has been updated to accept characters and accents. You may have the perfect quiz for 1st period biology, but maybe not 7th period. Quickly duplicate the quiz, swap some questions, randomize on the send, and you’re good to go. That means you eliminate cheating AND save time without having to build the quiz over again. Wahoo! There’s more coming! If you haven’t checked QuizBean out in a while, give it a spin. I’d love to hear any feedback – positive or negative – you have. You don’t get many chances to rename your baby. But, that’s just what we’ve done to QuizPoo. Starting today, QuizPoo is now QuizBean. But, don’t worry. The only thing changing is the logo. You still get the same great quiz maker you’ve come to know and love – unlimited questions, explanations, and pictures. Obvious Question #1: Why the name change? In our first life, we’re a team of guys and gals who build beautiful custom websites for amazing Vermont companies. But, there was a desire to build something fun and flexible. And QuizPoo met the bill. We launched the early version at TechJam in Vermont (a technology jobs fair, basically) to much fan fare. Now, it’s ballooned into something much bigger and people are spreading the word. We just want to make sure they’re spreading the right word. As we worked to spread the word about QuizPoo, teachers and corporate trainers caught on. And the feedback was unanimous — the name needed to change before many teachers were going to use it in their classrooms. No way, they were taking quizzes about poo (and we don’t blame them). That’s what prompted the name brainstorm. Obvious Question #2: How did you come up with QuizBean? We had all kinds of names spread out across, whiteboards, Basecamp docs, and Google docs. It seemed like every day, our team would throw in new name (QuizPoodle, QuizCopter, and QuizCrafter, just to name a few). After pushing off the decision for several weeks, we just had to make a decision. And we used the next tool to help us out. These are just plain fun. You can enter in any word, pair it with a noun, adjective, or verb of various lengths, and out comes a list of available domain names. And yes, we did spend countless hours on chat across the company IMing funny (and available) domain names. Here’s one to try out if domain name generators are your thing. Obvious Question #3: What does this mean for the future of QuizBean? In a recent survey we sent out, you let us know what you’re looking for in QuizBean – student progress analytics and student management. Oh, and multiple choice. We’re totally on it. In the coming months, we’re building all those features into QuizBean. Get your cone-shaped party hats ready for the launch party. We’re not going anywhere. Same great team, same great features. Plus, there will always be a free account. Just like a fine scotch, QuizBean will only get better with time. What do you think of QuizBean? Let us know in the comments below.